With liftoff on the horizon, ESA’s Aeolus satellite is going through the last round of tests to make sure that this complex mission will work in orbit — over the next month, Aeolus is sitting in a large chamber that has had all the air sucked out to simulate the vacuum of space. 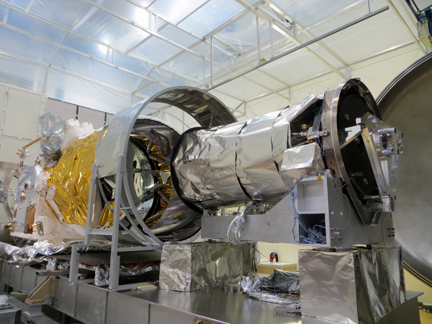 ESA’s Aeolus satellite ready to be put in the thermal–vacuum chamber for testing. Simulating the environment of space, the chamber is used to make sure the satellite will work in space. Aeolus will measure profiles of the world’s winds using novel laser technology. This will not only advance our knowledge of atmospheric dynamics, but also provide much-needed information to improve weather forecasts. Photo is courtesy of ESA. Aeolus carries one of the most sophisticated instruments ever to be put into orbit — Aladin — which includes two powerful lasers, a large telescope and very sensitive receivers. The laser generates ultraviolet light that is beamed down into the atmosphere to profile the world’s winds – a completely new approach to measuring the wind from space. These vertical slices through the atmosphere, along with information it gathers on aerosols and clouds, will improve our understanding of atmospheric dynamics and contribute to climate research. 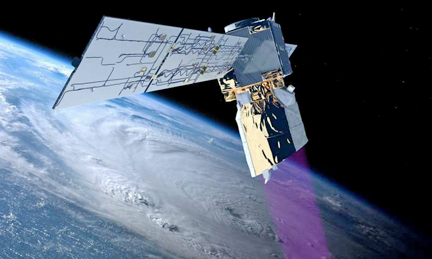 As well as advancing science, Aeolus will play an important role in improving weather forecasts. Carrying such novel technology means there have been challenges during development — but advancing space technology is never easy. With these difficulties in the past, the satellite is now undergoing final testing in Belgium before being shipped to French Guiana for liftoff, which is scheduled for the middle of 2018. ESA’s ADM-Aeolus wind mission will provide timely and accurate profiles of the world’s winds and further information on aerosols and clouds. Artistic rendition is courtesy of ESA/ATG media Lab. After having spent this spring at Airbus Defence and Space in Toulouse, France, where it was checked that it could withstand the vibration and noise liftoff and its ride into space, Aeolus has been at the Centre Spatial de Liège since May.